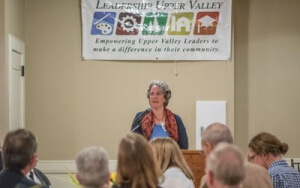 Elizabeth Sawin, Co-Director of Climate Interactive recently delivered a keynote speech at the Heroes & Leaders celebration of mentors, focusing on what she learned about mentoring from her mentor Donella (Dana) Meadows. Meadows was the founder of the Sustainability Institute (now the Donella Meadows Institute) and a co-founder of Cobb Hill Co-housing. Elizabeth worked with her from 1995 until Donella’s death in 2001. We asked Elizabeth to share the list of six traits of mentorship that she outlined in her speech in this blog post, previously posted on Vital Communities.